Foliage Type: 2 - 5" long, lanceolate, dark green. Bloom Time: Mid summer onward. Flower Form: Individual, flared trumpet-shaped flowers form dense pyramidal panicles ranging from 5-8" in size. Planting Instructions: Plant firmly, set the buds 1" - 2" below soil level. If potted, set at same level it is in the container. Firm soil and water thoroughly. Soil Requirements: Well drained. 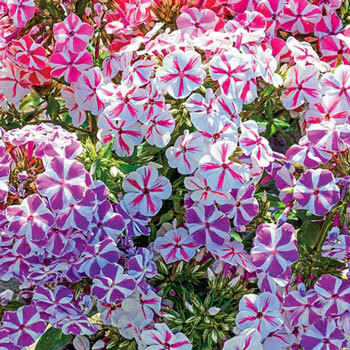 Many phlox tend to be susceptible to mildew, so plant in a sunny, airy location with good air circulation. Pruning: Remove spent flower heads to encourage reblooming. Trim back to 2"-4" if mildew is a problem. Additional Information: This variety of phlox is resistant to powdery mildew, a common problem with phlox paniculata.